Last weekend I was back at the Royal School of Needlework. Not to continue with the next module of my certificate course but to attend a 3-day class on drawing and design for embroidery. This class was offered as one of the RSN-day classes but was specifically aimed at certificate & diploma students but anyone could attend. The tutors for the 3 days were sisters Sarah and Caroline Homfray. As they are sisters they immediately created a relaxed atmosphere in the classroom with jokes and comments about each other. Both tutors have lots of experience in embroidery and art and they had brought lots of their own sketchbooks, art books and art materials with them for us to have a look at. They even decorated the central table with lots of different items (jars, masks, feathers, leaves etc.) that we could draw or be inspired by throughout the course. On the last day, they even turned the central table into a colour wheel by also using the odds-jars that were in the room. The main picture of this post shows the colour wheel after we had a play with different colour combinations. Day one started with introductions and telling everyone what you would like to get out of the course. 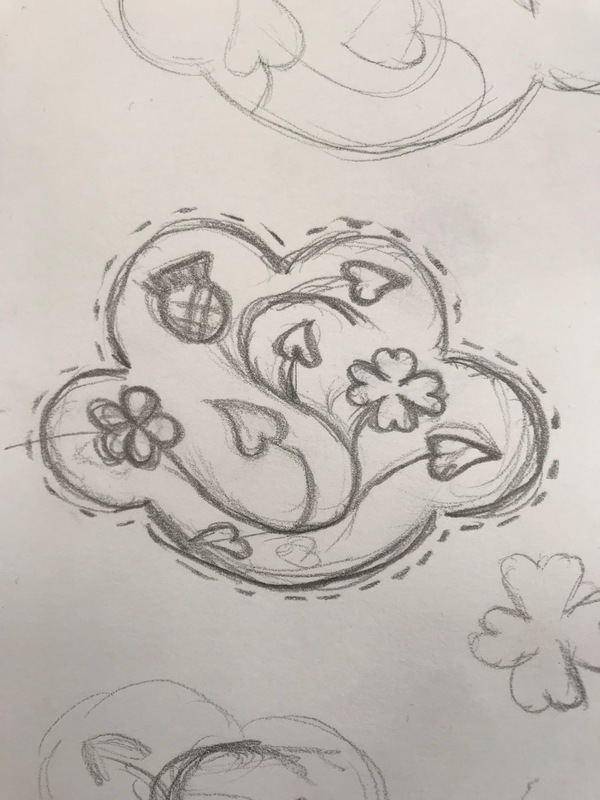 Most students, myself included, expressed the view that they couldn’t draw and would like to learn and feel more confident in designing for embroidery. Most of the first day we worked on gaining confidence in drawing by doing various exercises such a speed drawing, continuous-line drawing, drawing a design upside down, drawing with your ‘wrong’ hand. All of these exercises help you to stop thinking about what you are drawing and just go and do it. Moreover, by doing these weird exercises you lower your expectations of the outcome and you are actually pleasantly surprised with what you have achieved once you have finished. After lunch, we looked at shadows and experimented drawing items with shadows. I did find these exercises the most difficult of the weekend. It is normally not difficult to see light and dark, but it is difficult to see how they flow into each other through the mid tones. The daylight lamps in the classroom which are there to prevent shadows when embroidering didn’t help much! Day two, like the start of every day and when we came back after lunch started with some warm-up drawing exercises. 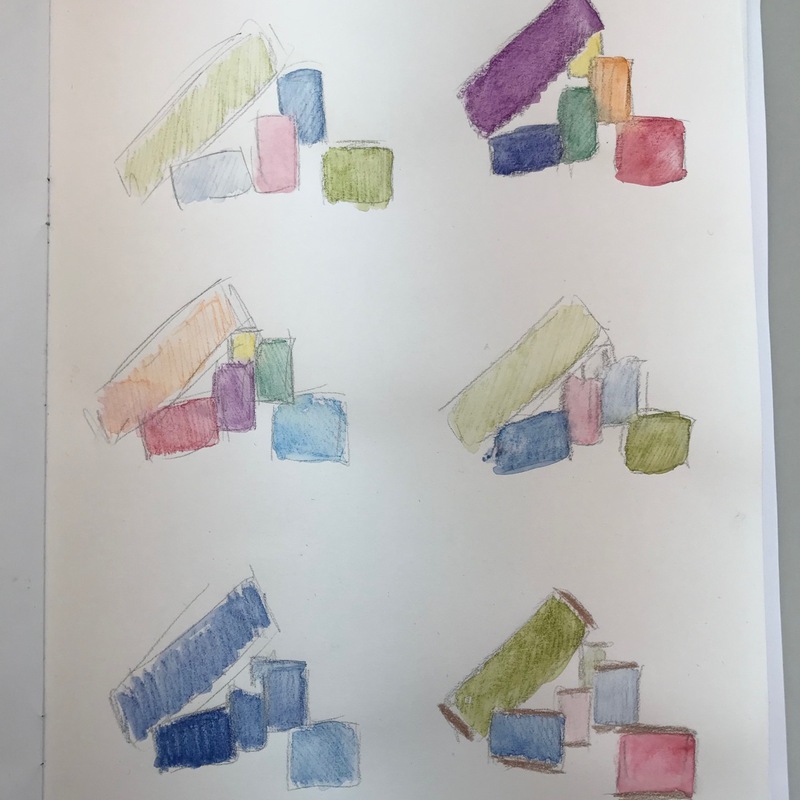 This day we focussed upon composition and talked about the rule of thirds and Fibonacci and looked at various pieces of art to discuss how the composition worked. After lunch, we worked on our ‘own’ composition using some items from the central table or from around the room. I made a composition of several spools. Throughout the day we are also allowed to experiment with the different art materials they had brought to see which we liked best. Day 3 was about colour. We discussed colour theory, shades, hues and tones and we made our own colour wheel. We also discussed how to use colour in embroidery and how to use shade cards. To create interest it is important that you don’t use the same tone of all of the colours you are using but create interest by using different tones. During the afternoon we were encouraged to work on our own designs and to think how they could be done in embroidery and ask any questions or focus a bit more on particular areas of the course that you wanted more information on. I did a colour study of my spools and talked to the tutors about threads and metalwork. I learned a lot during the course but most importantly it gave me the confidence to draw and design myself. It is a big topic to cover in just 3 days but the way the tutors approached the course give plenty of angles of continuing on your own. The tutors focussed on positive things, by regularly asking us ‘what went well’ or ‘what is going well for you’. 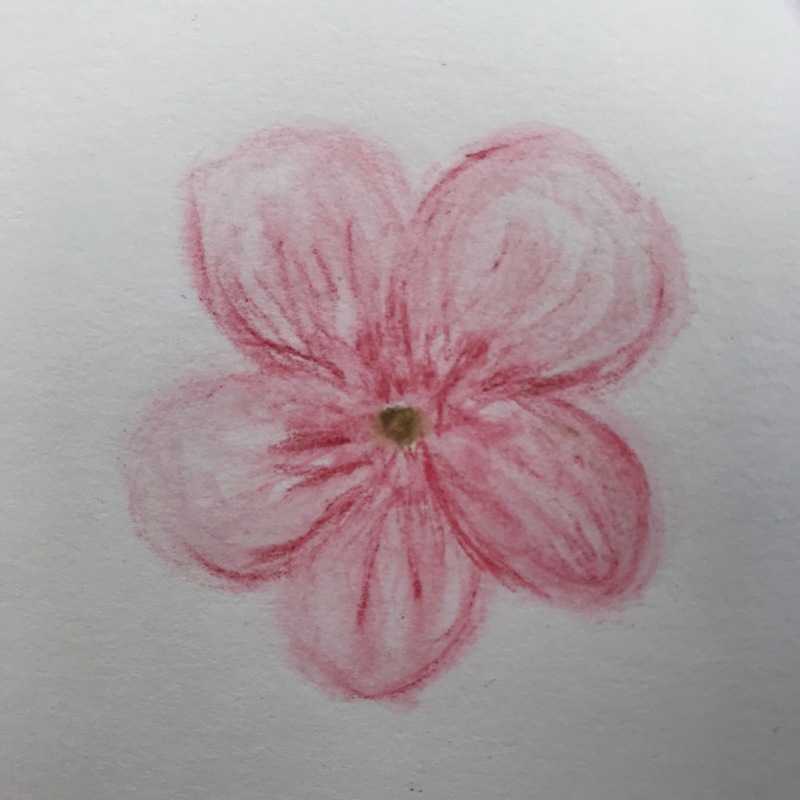 This really helped everyone gain lots of confidence and approach drawing, which we all found rather scary at first, in a positive manner. Moreover, we were able to give to tutors feedback, which they will take on board for their next class. I really recommend attending this course if you are intending to start the certificate or if you have already started it and would like to know more about drawing and design and to gain confidence. The RSN has already announced 2 more dates for this course (both in July 2018) but keep an eye on their website for new dates. When they are announced, you have to sign up quick as they fill up really fast! I am definitely keeping the drawing going and I already got some new artist materials, sketchbooks and books to help me. A student’s reaction to our recent embroidery class, taught with Sarah Homfray. I’m glad to see the Thinking Environment additions of ‘what’s going well?’ were a valued part of the course. Thanks, Marlous. Thank you for reposting Caroline! I am glad you liked my post! I love reading about your classes. Your descriptions are great; almost like being there. How many were in the class? Thank you Barbara! I am really glad you like reading my posts. That is why I write them, to give readers as much information as possible so they can find out what it is like and what you can get out of it. There were 10 of us in the class. What a brilliant quote to finish with! And one to keep in mind. 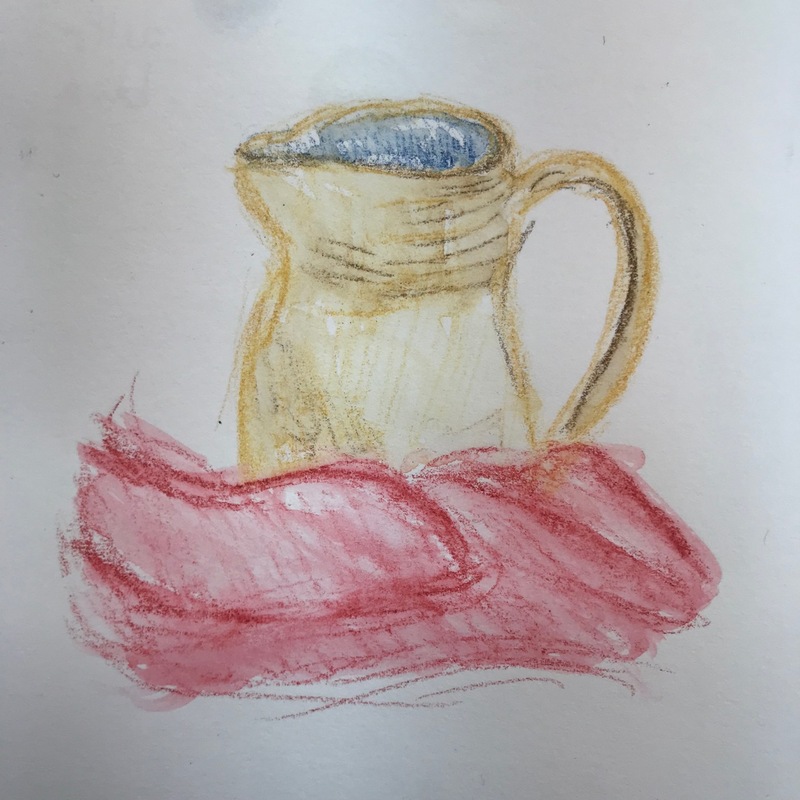 I don’t consider myself as someone with much drawing ability, though I have noticed my improvement throughout the RSN Certificate and when I (infrequently) design my own pieces. I’d love to do this one day, fingers crossed my dates will line up with one of them in the next year or two! Do keep an eye out for new dates as you pick up a lot from it, even if it is just more confidence in ones ability! I was heartened by the comment that drawing is a skill that can be acquired and not necessarily an innate ability. There is hope for us all! Thank you for an insightful look into the course. Thank you for lovely comments. Glad to hear I have made you feel better about drawing! I would add – it’s never too late! You can always get a better grip on drawing. But that said, the comment about excellence rather than perfection is a valuable one.. If you are aiming for perfection it can make you overwork and fiddle with your lines, losing flow and immediacy. In fact – Just Go For It! That is very true! It is never too late to learn anything! Whether you are young, old, just starting or very experienced, you can always get a better grip on things. You always take away something from a course!